Michel and Jaff RAJI are blood brothers. What defines them, beyond this fact, is their passion for the study of the essence and humanity of the body. Both of them, in their own way, have deepened their research using their own bodies. When they were young, Michel whose soul was already dedicated to the movement turned to dancing, while Jaff who was more of a talented athlete, chose the way of the martial arts. These multiple disciplines brought them into creating their own Way of expression and transmission. 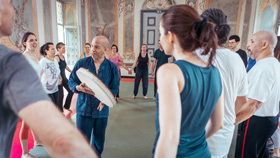 Michel experimented and founded the concept of CHOREOSOPHY and TRANCE LUCIDE DANCE, that are expressed with gathers Breath, Gyration, Dance and Rythm. 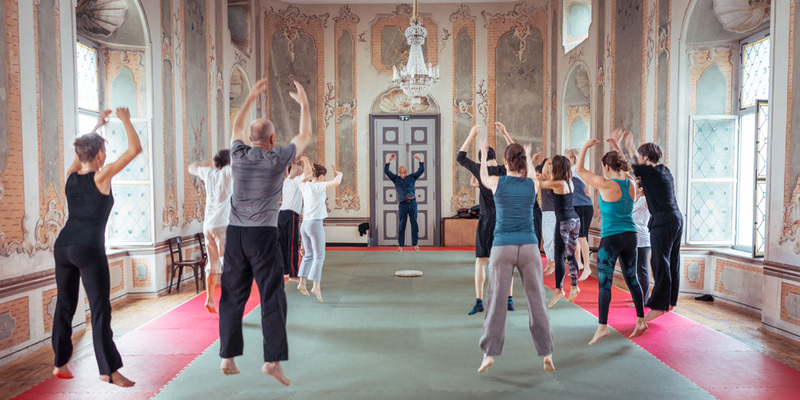 Michels dynamic breath-exercises, combined with rhythm, movement und voice will connect you instantly to the presence of you being here and now, beeing fully present! It´s a life-changing experience! Meanwhile, Jaff created a new body fitness concept called RAJI UKEMI FITNESS. Michel and Jaff often partner together to pass on their Art and prove that the human ways, as various as they can be, are and become One. For the third time, Schloss-Schule reunites the two brothers for an intense moment of genuine sharing and transmission. You will experience your body, breathing, moving, turning, gravitating and discover countless new sensations. Breath and Gravity with the RAJIS. Live the present time! Schloss-Schule- Familiy-Members are entitled to 10 per cent discount on the applicable fee. You will become a family member, when you are booking 3 courses or trainings in advance, or beginning with the third course/training you are booking. Once a Family-Member, you retain this status for three years. The family member fee is not applicable to some specific courses. Please use our online-form to register for this training. Please contact us during our office hours at +43/3183/8468.